Note: As the product and package updated, the product change name to Pro'sKit PT-5501G, but there is no other change with the product except that the plug from I-type to G-type(US standard). Slice through wires, old glue, plastics, wood and more with precision and accuracy. Carve images or text into glass, mirrors or other surfaces in order to create your own unique designs. Deburr jagged edges or remove unwanted rust to make old metals shine like new again. Smooth out bumpy and rough surfaces using one of the wide variety of included sanding bits. 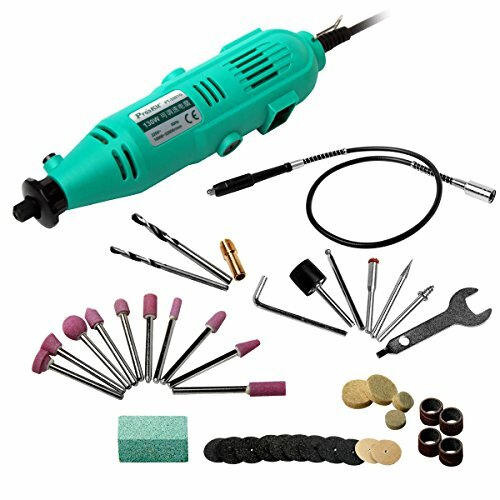 Craftsman Rotary Tool Kit can be drilling, cutting, grinding, polishing, carving and other work to use, PT-5501G is not just the electric grinding group so simple, at the same time with electric drill, carving pen function. You can make jade, crystal, jade, agate, glass, walnut, olives, wood, metal jewelry design, modification, etc., but also for cultural relics repair, chassis modification, etc. If you have any questions about this product by Tpmall, contact us by completing and submitting the form below. If you are looking for a specif part number, please include it with your message.